Ollantaytambo, a former Inca administrative center and gateway to the Antisuyo (the Amazon corner of the Inca Empire), sits at the northern end of the Sacred Valley. At the time of the Spanish invasion and conquest of Peru Ollantaytambo served as the last stronghold for Inca Manco Yupanqui, leader of the Inca resistance at the time. 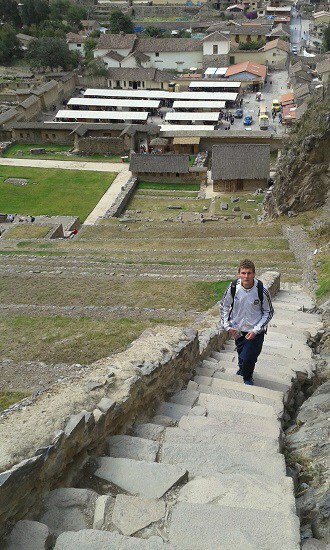 Nowadays the Ollantaytambo ruins and town are an important and popular tourist attraction in the Sacred Valley. The town’s primary attraction is the Ollantaytambo Fortress on the outskirts of the settlement in a section known as the Temple Hill. It is also a frequented attraction as many tourists catch the train to Aguas Calientes from here. QUICK TIP: Peru is MORE than just Machu Picchu. Make sure you visit Paracas, home of the Peruvian Galapagos and Huacachina, the only desert oasis in South America as well as other hidden gems. Find out how to discover all this on the way to Machu Picchu here! 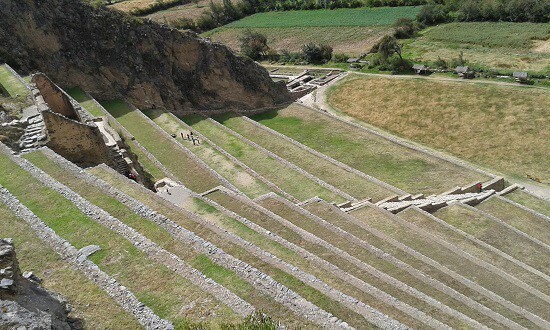 In the 15th century Inca Pachacutec conquered and began to rebuild the town of Ollantaytambo, constructing terraces for farming and an irrigation system. These huge terraces make up what is called the Fortress or Temple Hill. The town became home to Inca nobility. After Inca Pachacutec’s death, the town and its surroundings fell to the hands of his family and then eventually to those of Inca Manco. Inca Manco used Ollantaytambo as a retreat from the attacks of the Spanish. The fortress of Ollantaytambo, originally built for religious purposes, was the site of a major battle, one of the only successful ones against the conquistadors. From high above in the terraces of Ollantaytambo the Incas managed to hold back and defeat the Spanish, in addition they flooded the plain below forcing the Spanish to withdraw. The Spanish had been, briefly, defeated. Manco Inca retreated to the jungle stronghold of Vilcabamba shortly after the battle, knowing that the Spanish would return with even more force. The fortress of Ollantaytambo was soon captured by Pizarro and his men. As you climb the Inca stairs to the top of the fortress of the Ollantaytambo ruins you begin to fathom just how large this structure is. The terraces are taller than the average man and much wider than they look from the bottom. At the top of the fortress is the military area. From here is where Inca Manco and his soldiers watched for the Spanish invaders. This was a great vantage point, and only when you get up there do you realize how high you are up and how much you can see out to the Sacred Valley. A short distance from the top of the fortress you enter the temple complex. This section includes many finely crafted stone pieces such as the Enclosure of the Ten Niches. As you enter the important Temple of the Sun you will see a number of discarded large stone known as piedras cansadas, tired stones. This uncompleted temple holds the Wall of the Six Monoliths. Each of these stones weighs 50 tons and were brought from the nearby quarry. The Temple of the Sun was like a calendar for the Incas and had specific purpose especially on the 21st June, the winter solstice and the 21st December, the summer solstice. 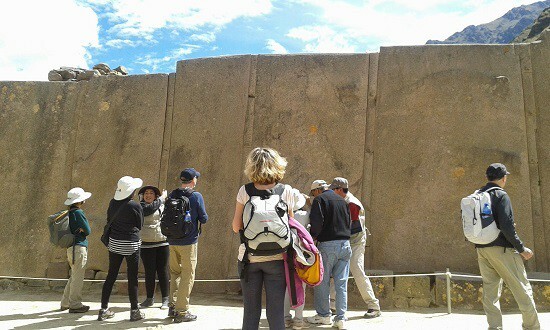 Guides usually carry booklets or folders with photos, these photos demonstrate the uses of the temple of the sun, the sun dial and other features the Incas built and used. 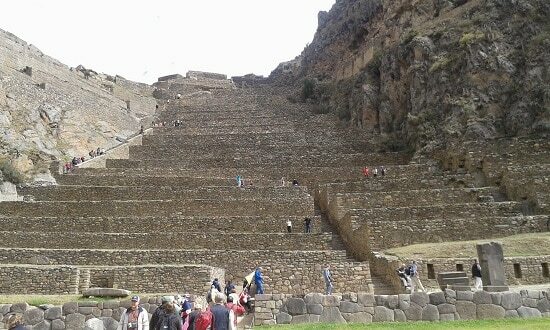 Had the sun temple structure at Ollantaytambo been completed it would have been a spectacular construction. The reason for it being left like an ancient building site are unknown. But more than likely due to with attacks and abandonment. The site of the Ollantaytambo ruins has many more beautifully built structures. As you move away from the Sun Temple the pathway takes you towards Balcon Pata. This is a narrow ledge that leads to two large buildings for you to explore and more terraces. From here you start your decent back down to the ceremonial area at the base of the fortress. Here you will enter an area full of baths and fountains that serve as both an irrigation system and as a religious center. The Princess Bath, Banos de Nusta, being one of the most beautiful, made from granite rock. This fountain has some beautiful examples of the fine Inca carvings and stone work. The Patakancha River flows through and feeds the fountains in this area. From the terraces if you look across the valley you can see the ruins of the old store houses built by the Incas. These were known as qollqa. They were used by the Incas to store agricultural crops to feed the town. They made the movement of the crops easier, through the specifically built and structured narrow windows in the store houses. If you take a closer look you will see a face carved into the rock face. This is the face of Wiracocha, the deity. The Incas believed he was the creator of all. He is depicted with a pointed bonnet on his head and carrying some heavy sacks on his back. It is possible to climb to the storehouses and to the face of Wiracocha. It is a steep and vertical climb that can take your breath away. But when you reach the site you have a great view of the town below and across to the Temple Hill. You can also visit the Inca quarry from where the large blocks are believed to have come from. The quarry is on the opposite side of the river, about a 6km hike from the town, which will take a few hours. The walk begins from the Inca bridge that crosses the river at the entrance to the village. On the hike to the quarry you will pass more piedras cansadas, similar to those seen at the unfinished Sun Temple at the top of the Ollantaytambo ruins. 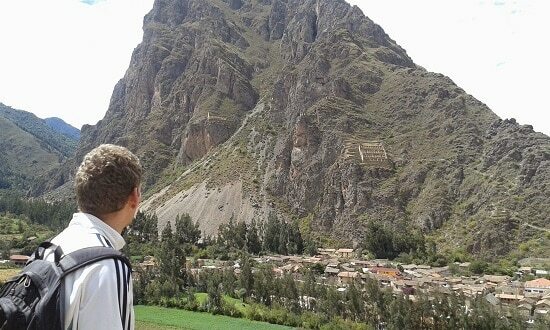 Don’t forget to have a good look back towards the Ollantaytambo ruins, they will appear to look like a pyramid. Getting from Cusco to Ollantaytambo is very easy. You can jump in a collectivo from Calle Grau, about a ten minute walk from Cusco’s Plaza de Armas. From here you can share a minivan with other passengers for 10-12 soles per person. THE ONLY PERU GUIDE TRAVELING TIP: Peru Hop buses are the best and safest way to get to and from Cusco, home of Machu Picchu. Peru is also home to several other fascinating ruins and historical sights traced back to different stages of Incan and pre-Incan history. A few examples would be Pachacamac in Lima, the secret slave tunnels of Chincha or Moray just outside of Cusco. If you’re interested in experiencing a few different elements of Peruvian culture and history rather than simply seeing Lima and Cusco, we recommend you take a bus rather than flying straight. There are some fascinating, unexplored destinations that you can visit to experience authentic Peruvian culture. For this, we strongly suggest taking Peru Hop‘s route along the coast. This route also ascends gradually which will give you some important time to acclimatise to the thinner air and help prevent altitude sickness in Cusco. For many travellers, particularly ones who take awhile to acclimatize, the effects of altitude will consist of some shortness of breath and a bit of a headache. However, if any of these conditions get worse or fail to improve after a few hours, it can be a severe even life threatening problem, and should not be treated without concern. Some extra planning should be made to ensure you look after your health. If you wish to read more about Altitude and fighting altitude sickness take a look at The Only peru Guides official page on Acclimatizing to peru.